高田雄太, 他: マルウェア対策のための研究用データセット ～ MWS 2016 Datasets ～, 情報処理学会, Vol.2016-CSEC-74, No.17, 2016年7月. 神薗雅紀, 他: マルウェア対策のための研究用データセット ～ MWS 2015 Datasets ～, 情報処理学会, Vol.2015-CSEC-70, No.6, 2015年7月. 秋山満昭, 他: マルウェア対策のための研究用データセット ～ MWS 2014 Datasets ～, 情報処理学会, Vol.2014-CSEC-66, No.19, 2014年6月. 神薗雅紀, 他: マルウェア対策のための研究用データセット ～ MWS 2013 Datasets ～, 情報処理学会シンポジウムシリーズ, Vol.2013, CSS2013 (MWS2013), 2013年10月. 畑田充弘, 他: マルウェア対策のための研究用データセット ～ MWS 2011 Datasets ～, 情報処理学会シンポジウムシリーズ, Vol.2011, CSS2011 (MWS2011), 2011年10月. 畑田充弘, 他: マルウェア対策のための研究用データセット －MWS 2010 Datasets－, 情報処理学会シンポジウムシリーズ, Vol.2010, CSS2010 (MWS2010), 2010年10月. Mitsuhiro Hatada, Mitsuaki Akiyama, Takahiro Matsuki, Takahiro Kasama, "Empowering Anti-malware Research in Japan by Sharing the MWS Datasets," IPSJ Journal of Information Processing, Vol.23, No.5, pp.579--588, Sep. 2015. 畑田充弘, 他: マルウェア対策のための研究用データセットとワークショップを通じた研究成果の共有", 情報処理学会シンポジウムシリーズ, Vol.2009, No.11, CSS2009 (MWS2009), pp.1--8, 2009年10月. 三輪信介, 宮本大輔, 櫨山寛章, 井上大輔, 門林雄基, "模倣DNS によるマルウェア隔離解析環境の解析能向上", サイバークリーンセンター・情報処理学会, マルウェア対策研究人材育成ワークショップ2008 (MWS2008), 2008年10月. S. MIWA, T. MIYACHI, M. ETO, M. YOSHIZUMI, and Y. SHINODA, "Design Issues of an Isolated Sandbox used to Analyze Malwares," In proceedings of Second International Workshop on Security (IWSEC2007), LNCS 4752 Advances in Information and Computer Security, ISBN 978-3-540-75650-7, pp.13--27, Oct. 2007. S. MIWA, T. MIYACHI, M. ETO, M. YOSHIZUMI, and Y. SHINODA, "Design and Implementation of an Isolated Sandbox with Mimetic Internet used to Analyze Malwares," DETER Community Workshop on Cyber Security Experimentation and Test 2007 (DETER07), Aug. 2007. 三輪信介, 門林雄基, 篠田陽一, " 小規模攻撃再現テストベッドによる動作記録データセットの生成", サイバークリーンセンター・情報処理学会, マルウェア対策研究人材育成ワークショップ2009（MWS2009）, 2009年10月. Mitsuaki Akiyama, Kazufumi Aoki, Yuhei Kawakoya, Makoto Iwamura, and Mitsuataka Itoh, "Design and Implementation of High Interaction Client Honeypot for Drive-by-download Attacks," IEICE Transactions on Communication, Vol.E93-B No.5 pp.1131--1139, May. 2010. 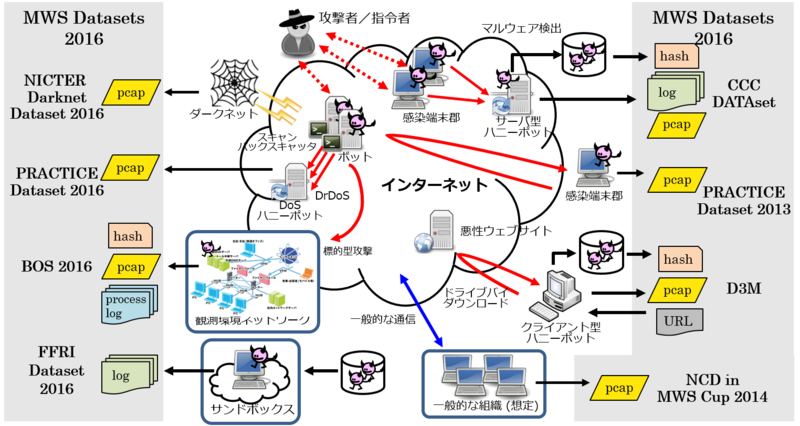 K. Nakao, K. Yoshioka, D. Inoue, M. Eto, and K. Rikitake, "nicter: An Incident Analysis System using Correlation between Network Monitoring and Malware Analysis," In Proceedings of the First Joint Workshop on Information Security (JWIS 2006), Sep. 2006. 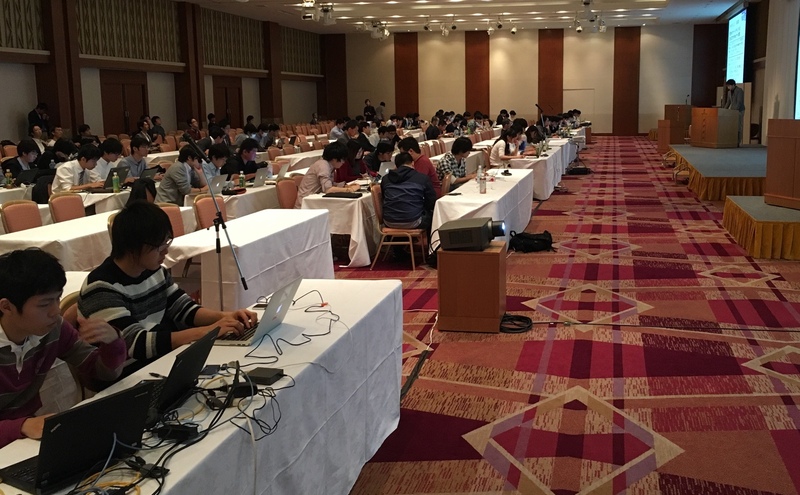 D. Inoue, M. Eto, K. Yoshioka, S. Baba, K.Suzuki, J. Nakazato, K. Ohtaka, and K. Nakao, "nicter: An Inciden Analysis System Toward Binding Network Monitoring with Malware Analysis," In WOMBAT Workshop on Information Security Threats Data Collection and Sharing, pp.58--66, 2008. 寺田真敏, 青木翔, 楠美淳弥, 重本倫宏, 萩原健太, "研究用データセット「動的活動観測2014」の検討", 情報処理学会,マルウェア対策研究人材育成ワークショップ2014 (MWS2014), 2014年10月. 寺田真敏, 堀健太郎, 成島佳孝, 吉野龍平, 萩原健太, "研究用データセット「動的活動観測2015」", 情報処理学会,マルウェア対策研究人材育成ワークショップ2015 (MWS2015), 2015年10月. cation DDoS Attacks," In Proceedings of the 18th International Symposium on Research in Attacks, Intrusions and Defenses (RAID), Nov. 2015.